We’ve been in the Pearl Islands for a little over two weeks now and have had a wonderful time. We are traveling in the company of Brit & Axel on Hello World and met up with Shared Dreams, Legacy and Warrior for a marvelous Christmas potluck. 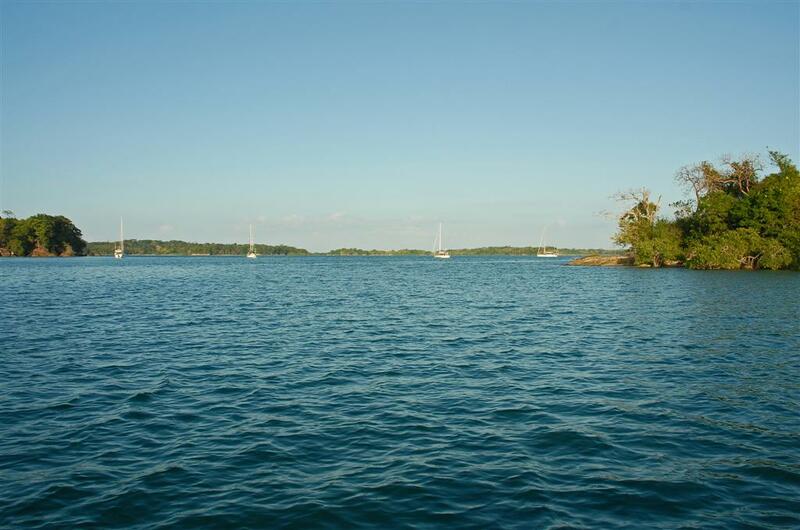 The Pearl Islands are a group of islands about 40 miles south of Panama City in the Bay of Panama, with about 30 different anchorages on several small islands around the large island of Isla del Rey. We’ve seen alot of the area in these two weeks, but could spend much more time here. The Christmas turkey we brought down from Panama City was a huge success, thanks to Rob’s roasting. At the potluck that night we had enough food for another 5 boats and everyone enjoyed the feast. A little excitement was added to the evening when Rob dropped the very sharp carving knife on his big toe and did some serious projectile bleeding all over Hello World’s cabin sole. But they all came to the rescue and bandaged him up and the toe is nearly back to new now. There have been many beautiful white sandy beaches to explore, lots of nice shells to collect, mostly clear 80 degree water for swimming every day, some kayaking, and even a little snorkeling and diving. We did a dive with Brit & Axel in a shallow area with 30′ of water and some pretty good surge. Being my first dive in quite a while, I didn’t relax and get comfortable until the dive was nearly over. But the good news is that we finally had a chance to fire up the compressor and succesfully refilled our air tanks in the cockpit of the boat. For New Year’s Eve (called Silvester by the Germans) we shared an anchorage again with Hello World, Shared Dreams and Legacy. We kayaked in the morning, had a late potluck, and then we played a game of cards to keep us all awake until the midnight hour. We all managed to ring in the New Year and even tried a little dancing on the aft deck of Hello World. Now we’re heading back north tomorrow to get back to Panama City. Sadly we need to get reprovisioned and start moving west. There is much to see in Western Panama before we head back up to Costa Rica to meet up with T2. And the reprovisioning stop in Panama City is a huge one, as this is the last place we’ll see the convenience foods and products we’re used to from home until we get to New Zealand in November. Supplies in French Polynesia are amazingly expensive, so I’m going to stowe as much stuff as I can into my little cupboards and freezer. We’ve agreed to meet back up with Hello World for some diving on Cocos Island, which is about 200 miles west of Costa Rica in the Pacific. Cocos is a very well protected marine park where divers pay thousands of dollars for an opportunity to explore the clear warm waters. I thought it would be a great opportunity since we’re going in that general direction from Costa Rica to the Galapagos. What I failed to understand when planning the stop is that the waters are teeming with hammerhead sharks and that’s one of the big attractions for the divers. For some reason we’re still planning the dive, so stay tuned to see what those pictures look like (and if I’m even in the water while Rob’s taking them)! And just for the record, we finally got the last piece of equipment that we bought in Seattle installed on the boat. Last week our wind generator was finally mounted and wired up and started pumping amps into the batteries. So my brother Dale can stop snickering now at all the boxes of “stuff” we had in the cabin when we left, and any future cruiser getting their boat ready to leave can believe you don’t have to have the boat ready before you go.